The crew of HMS Spitfire of the 4th Destroyer Flotilla, Grand Fleet had been waiting months, years even, for ‘Them’ to come ‘Out’. 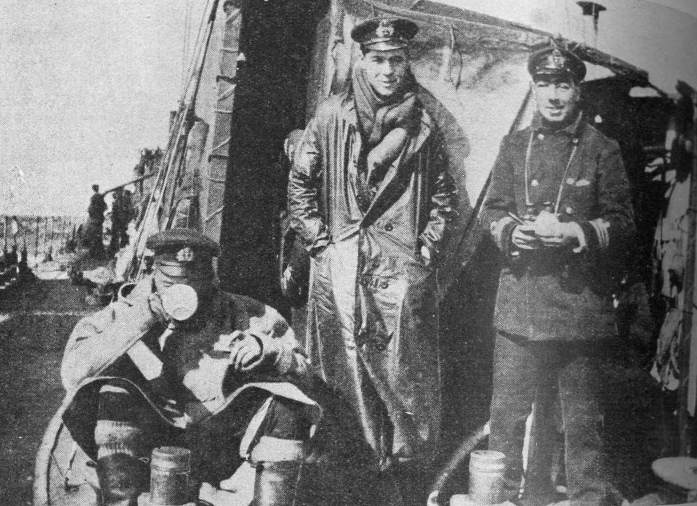 They had been based at Scapa Flow since February 1915, waiting, and patrolling. Patrolling the Hoxa Sound, the Pentland Firth, escorting ships to Cromarty or Rosyth, screening the Battle Fleet out on PZ exercises, boarding merchant ships or fruitlessly searching for submarines and minelayers. And occasionally proceeding at speed south toward Heligoland, or East for the Skaggerak on a ‘stunt’, hoping that there really was ‘something doing’ this time. A personal diary entry for April 1915 notes a busy morning watch with plenty of submarine screening etc. « Met the Battlefleet at 4.00 am. We are steaming S50°E 15 knots which is straight for the Skaggerak. Nothing much happened all day. We all thought we might see something this time; so one can imagine how sick we were when at 6.0pm we all turned round ». The Spitfire officers would spend the long winter nights ship- visiting, dressing up to entertain, or quietly playing Bridge and Vingt John. In March 1915 they had purchased a monkey for the ship, arguing about where it would sleep (Captain’s cabin, eventually). In September a ping-pong tournament was organised and Spitfire lost to a combined Shark / Acasta team. Though very often the weather prevented any socialising so there was time to write a lot of letters, and wait for the mail. 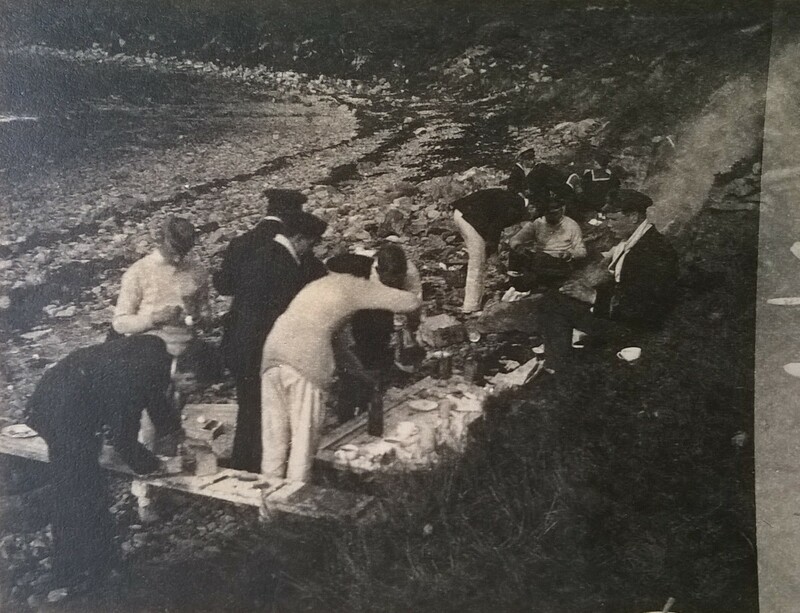 During the long summer days of 1915 officers of the Flotilla had taken to picnicking ashore, and Tuesday 30th May 1916 was no different – a picnic was arranged that day and officers from the Spitfire, Shark, Sparrowhawk, Ardent, Fortune & Acasta cooked up tea on a stony beach. But by that evening, at short notice, they were steaming out of a sunset, Eastward with the Battle Fleet; the Acasta and Shark detached to screen the three Battlecruisers, Spitfire and the rest of the 4th Flotilla screening the port wing of the Battle Fleet. 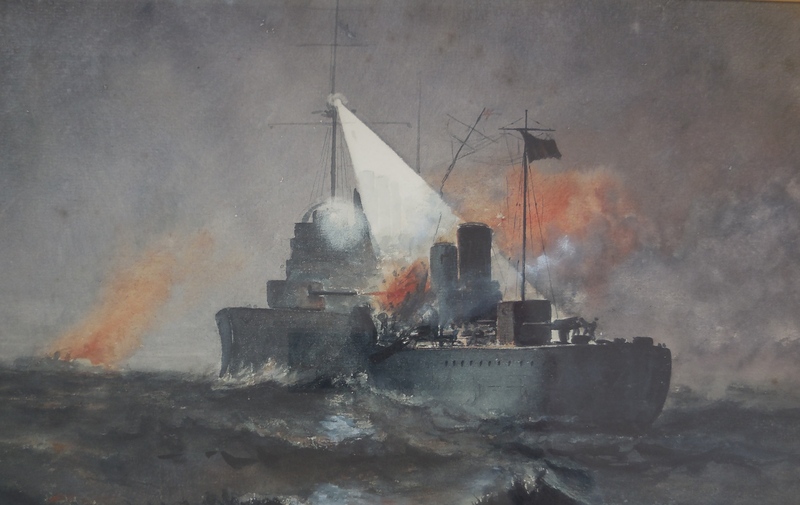 Through the night and into the next day, still Eastward and a little South, learning during the afternoon that the Battlecruiser Fleet were in action; gradually increasing speed towards the south, making them more certain that they should at last be in action. They were ordered to get ahead of the deploying Battle Fleet as they were on the Fleet’s disengaged side. The wakes of so many vessels going at full speed close beside each other caused the most curious breakers. These were occasionally mistaken for the signs of submarines, and a good deal of firing took place away behind them. Presently, the destroyer Acasta came hurtling right across the track of the Fleet. She was flying ‘not under control’ signals. They were now ahead of the Battle Fleet awaiting orders, knowing that they may be ordered to deliver, or repel a torpedo attack at any moment. Shot was falling within sight though not reaching them and all the while watching, and waiting. 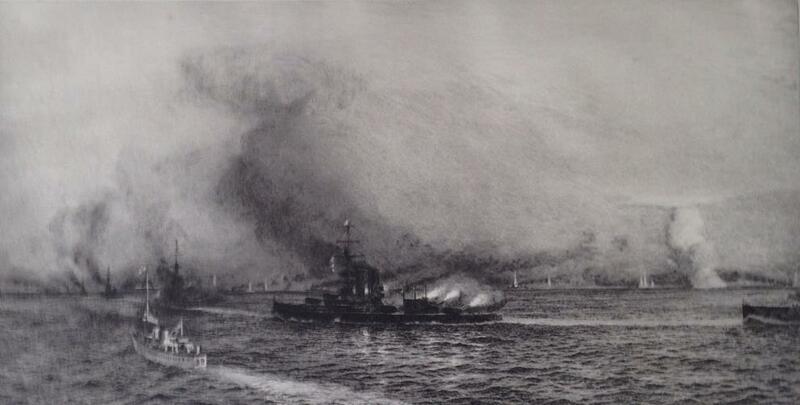 Visibility was worsening due to smoke from gunfire, mist and enemy smokescreens. And by dusk they could hear only sporadic salvos, ahead and behind them. At 9.30pm they were forming up 5 miles astern of the Battle Fleet. They did not know the outcome of the battle, where the enemy were or even where most of their ships were – only that they should form 5 miles astern of the Battle Fleet. By 10.00pm they were settled in line ahead – Tipperary leading, Spitfire, Sparrowhawk, Garland and Contest of the 1st Division following. It was a very dark night as there was no moon, and the sky was overcast and the atmosphere hazy. They were very nervous of running into their own ships by mistake and had been ordered to keep a sharp lookout for the enemy. In the darkness they could make out ships closing them from astern, Tipperary made the challenge; they were British. Shortly before midnight they saw again the dark shape of a line of ships on their starboard quarter, occasional glare in their funnel smoke. Some thought they were friends, but they could just as well be the enemy, so 21” torpedo tube and 4” gun were kept trained on them. Maybe it reminded them of a patrol in early 1915 where it was moonlight. The St Vincent came out – we could have got in a lovely shot with our mouldies, about 8000 yds – she never saw us till we challenged her. 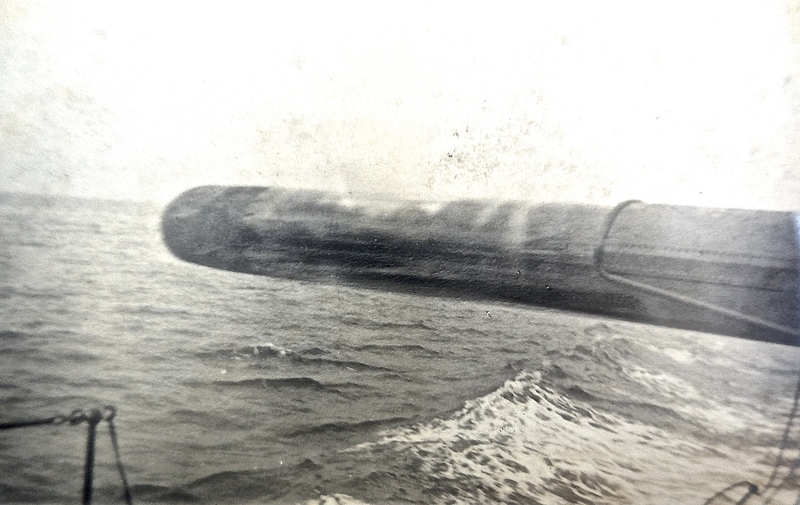 But they could not load the spare torpedo due to damage sustained to the loading gear; the Torpedo Gunner was injured and the majority of the torpedo ratings were either injured or killed. The Captain decided to go to the assistance of the Tipperary and, if necessary, carry on action with their guns. As they got near he felt maddened at seeing their leader disabled and being so fiercely attacked. He gave what seemed the hopeless order to fire at searchlights, which, as if at target practice, winked, and went out. and with a ghastly, fearful crash the two ships met port bow to port bow. In the glare of searchlight men were hurled across the deck and one man from the fo’c’sle gun’s crew was lost overboard. The ship rolled like she had never rolled before and the sides of the two vessels bumped and ground together, ripping plate and scuttle. When they were bridge to bridge the German fired her forward main armament probably 11”, point blank at us. The shell passed over my head and through the bridge. The blast was terrific  and reduced the bridge to a mass of tangled wreckage. The projectiles themselves did not detonate, but as they passed through they decapitated one man, and cut another in two, either side of the Captain. The Captain himself was thrown by the blast 24 feet onto the upper deck, face down with his head over the side, unconscious. The rest of the bridge personnel were killed or wounded by concussion. The huge German ship « surged down our port side, clearing everything before her; the boats came crashing down and even the davits were torn out of their sockets, and all the time she was firing her guns just over our heads ». But none of the shells seemed to hit. And all the while the German vessel kept the Spitfire illuminated until finally clearing her astern. Spitfire was left afloat, but drifting in a somewhat pitiful condition. The Captain could not be found, so the 1st Lieutenant took command. His two concerns were to regain control of the ship and put out fires that might draw unwanted attention. The moment of collision. The 935 ton Spitfire rams into the 20,000 ton SMS Nassau. 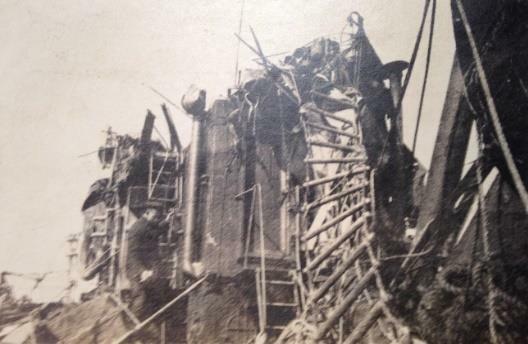 A large-calibre shell had grazed the deck and the bottom of the second funnel. A second fire was spouting from the hole and stokers beneath in the foremost boiler-room had to don gasmasks. Many of the fire hoses were cut by splinters and useless so it took time to get these fires under control. An inspection of the engine-room and boiler-rooms found that three of the four boilers were functioning and that the ship was capable of 6 knots. 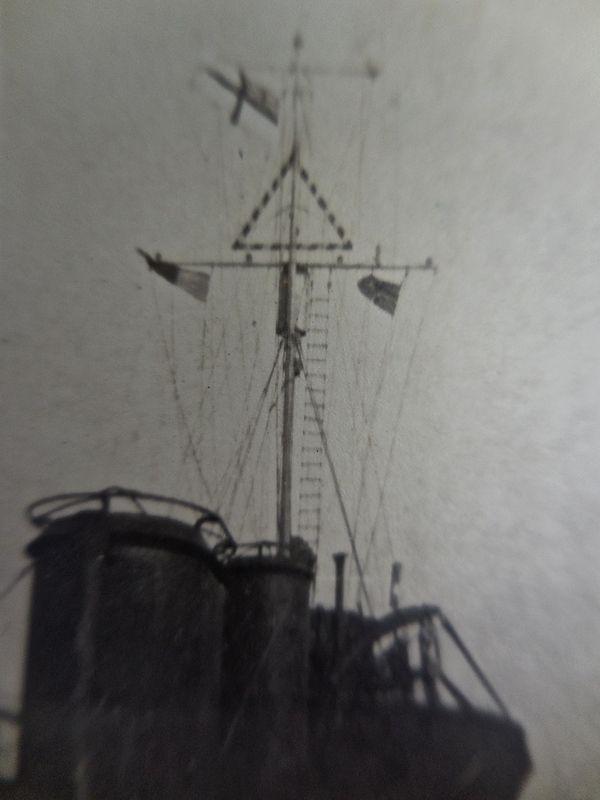 And as the bridge had been destroyed a voice- pipe was rigged to the engine-room from the compass aft, and for about half an hour they steered by that. They had noted their course of NW shortly before the collision, however, they had no Coxswain and the two Quartermasters were injured, one in the right hand, one the left; but they took charge of the wheel – one ‘Navy Pattern Quartermaster’ as Rudyard Kipling later put it. 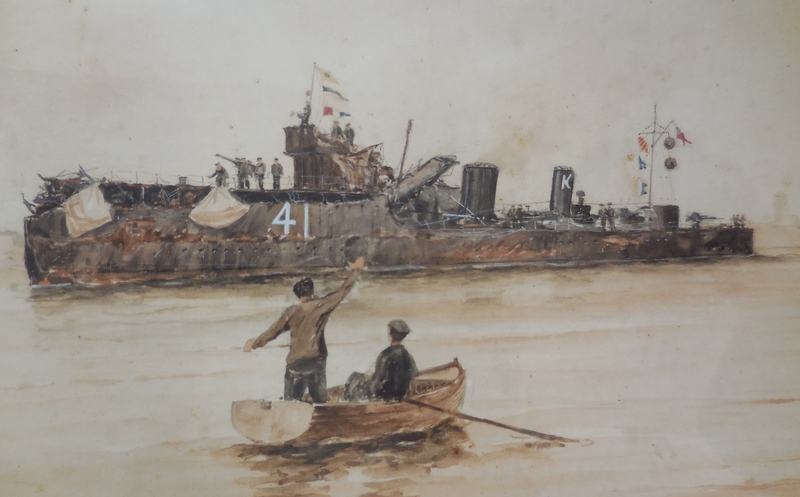 The Captain, Sub, Gunner, Coxswain and Chief Stoker were all missing – the latter was found with a broken jaw under the Downton pump, and the Coxswain, delirious, under the remains of his wheel. He was got out, but an Able Seaman also on the bridge was trapped and had to have his leg amputated, in the dark, with no anaesthetic. 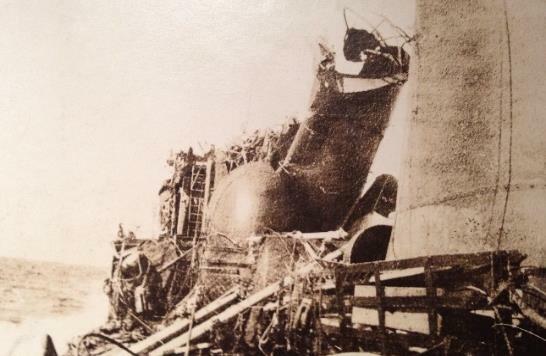 The main concern was the damage to the bow – a huge, lengthways gap of about 60 feet. Attempts were made to shore this with whatever was to hand but any shoring was washed away time and time again. Mess, shell and storerooms forward were flooded or unreachable causing concern bulkheads would not hold. All three 4” guns however were found to be undamaged and crews found for them. And they were finally able to load the spare torpedo. With the galley being undamaged they had some food, a cup of cocoa and a tot of rum was served to the men which cheered them up no end. The original intention was to make for Harwich; but as wind and sea rose they were forced gradually northwards. They took position and directions from a Norwegian merchant ship, following its wake for a time as they assumed that would lead them towards the English coast; but again the weather edged them northward as they attempted to protect their damaged bow. The wind still increased to a gale and at 1.00 am it was decided there was little choice but to fire distress signals. They got the box of ‘fireworks’ up and sat on them, unable to quite bring themselves to use them. But with dawn breaking for a second time, as if, it seemed to them, by a miracle, the wind moderated and the sea became smooth finally enabling them to make 10 knots. 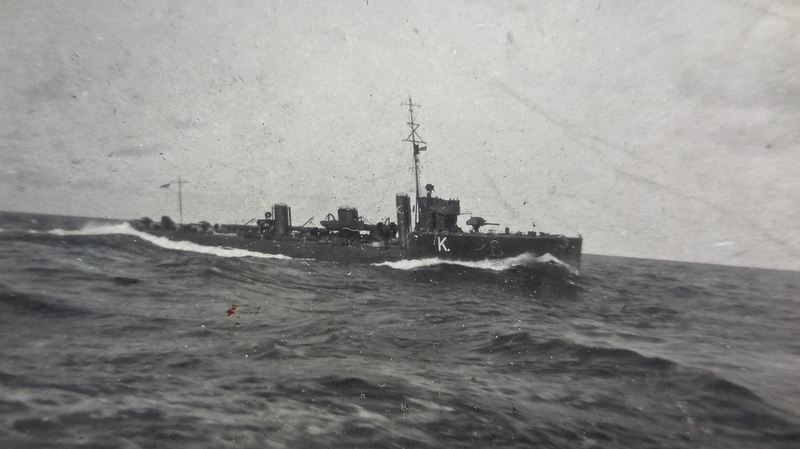 After meeting some minesweepers they made landfall about 20 miles from the Tyne, and refusing to take a tug – the two Quartermasters still at their posts after 36 hours, guided the ship between the piers at about noon 2nd June.